FORT LEONARD WOOD, Mo. (March 31, 2016) Fort Leonard Wood is home to a combat engineer unit that is not only unique to the Army, but to the entire U.S. Military. The 94th Engineer Detachment, 5th Engineer Battalion, is the only combat engineer unit with mine detection and specialized search dogs. "This is the only unit in the entire U.S. military with the mine detection dog program," said Sgt. 1st Class John Bornhoeft, kennel master, 94th Engineer Detachment. 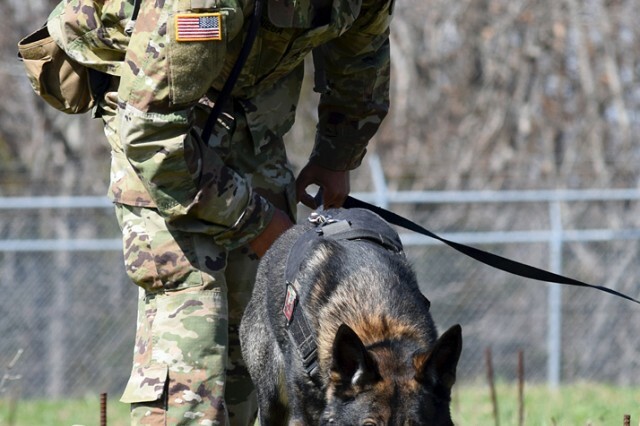 While the origins of the Army K9 program can be traced back to World War II and again in Vietnam, the current mine detection dog program has only been around since 2005. The unit was reestablished for Operation Iraqi Freedom and Operation Enduring Freedom, because of the influx of mines being used in combat, Bornhoeft said. "We are primarily used for locating land mines, unexploded ordnance or other hazardous or explosive materials," he said. Following the example of the British army and their mine detection program, the Army initiated their own experimental program, and by 2006, the Engineer K9 Company was in full operation. At its peak, the company had as many as 72 dog teams with 90 Soldiers in three detachments, Bornhoeft said. Now they have 17 dog teams with 29 Soldiers in one detachment. 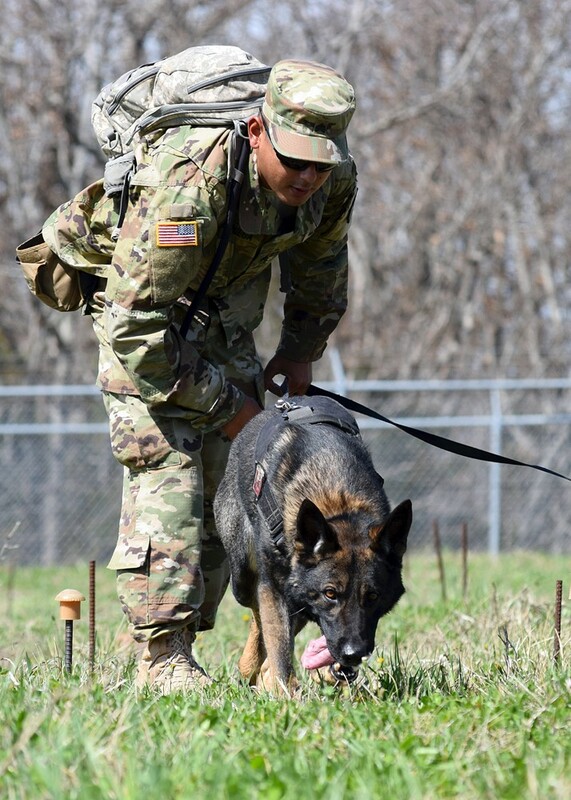 The path to become a handler starts at the Combat Engineer Mine Detection Dog Handlers Course, also at Fort Leonard Wood. In the 20-week course, Soldiers earn the additional skill identifier of K9, according to Staff Sgt. Erik Kolbow, noncommissioned officer in charge, Combat Engineer Mine Detection Dog Handler School. Skills required for mine detection dog handlers include first aid to military working dogs, animal behavior, scent picture and kennel maintenance. A dog has to achieve a 100-percent-successful find rate in order to maintain certification, Kolbow said. This standard is higher than any other military working dog program in the military. Because of a high requirement for the teams to be perfect, the detachment is training nearly every day, said Spc. Jose Duran, mine detection dog handler. Training each week consists of basic skills such as scent and detection training and obedience training. Since they are animals, Duran said the mine detection dogs require consistent care and reinforcement to maintain the standard. Maintaining that standard has proven to work well when dog teams from the detachment have been deployed, Kolbow said. "Time and time again, MDDs proved their importance, while deployed to either Iraq or Afghanistan," he said. "Whether it was finding an IED that was buried six-feet deep, performing casualty extraction missions, leading dismounted patrols and/or route-clearance missions, the MDDs never faulted. Their ability to find buried odor and land mines is something that cannot be duplicated." As a deployed combat engineer, Bornhoeft said it was seeing the mine detection dogs in action that motivated him to try and join the detachment. "When I saw the application in-theater in Iraq, I thought it was a unique and self-rewarding opportunity," he said. Bornhoeft said he saw the same gratitude in the faces of Soldiers he helped when he was deployed with his dog twice. "When you go and help out a unit or you find an IED that they didn't know was there, just the gratitude alone from those Soldiers is overwhelming. It makes you feel like you have purpose," he said. As the detachment slows down on deployments, they are looking to expand their role. "Once deployments started dying down, we have turned to more peace-time missions as far as mine-hunting goes," Bornhoeft said. "We are looking at getting back into range clearances. Our dogs are perfect for that."